1X. Duan, R. P. Giddings (e-mail: r.p.giddings@bangor.ac.uk), and J. M. Tang are with the School of Electronic Engineering, Bangor University, Bangor LL57 1UT, UK. 2S. Mansoor is with the School of Computer Science, Bangor University, Bangor LL57 1UT, UK. Digital filter multiple access (DFMA) passive optical networks (PONs) exploit centralized software-defined networking (SDN) controller-managed and transceiver-embedded digital orthogonal filters in individual optical network units (ONUs) to enable end-users to adaptively and dynamically access and share a common fiber transmission medium. DFMA PONs have the potential of not only equipping NG-PONs with sufficient network operation flexibility, adaptability, elasticity, and reconfigurability, but also providing highly desirable backward compatibility with current PON standards. 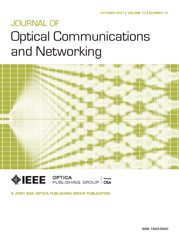 In this paper, for the first time to our knowledge, multipoint-to-point upstream signal transmission in intensity-modulation and direct-detection (IMDD) DFMA PONs is experimentally demonstrated using two real-time, reconfigurable, optical orthogonal frequency division multiplexing-modulated ONUs and an offline optical line terminal. The experimental demonstrations show that each ONU achieves a similar upstream bit error rate performance, excellent tolerance to inter-ONU sample timing offset, and a relatively large ONU launch power variation range. b Equivalent to 10 Gb/s NRZ data (PRBS 231−1) at a BER of 1×10−9.